LGBTQ Connection, a nonprofit initiative supporting the local LGBTQ community, is trying to reach members of the Spanish-speaking community by adding familiar faces to the mix. Organizers are recruiting volunteers who grew up in Napa, work in Napa, speak Spanish and have ties to the Spanish-speaking community. When it comes to LGBTQ issues, the Spanish-speaking community hasn’t had the same opportunities “compared with native English speakers,” says Ian Stanley Posadas, program director. Families want to learn more and want to understand, he said. They want to be able to support their children, whether or not they identify as being lesbian, gay, bisexual, transgender, queer or questioning. The problem isn’t the community members, it’s been the barriers they face. “The barriers have been a lack of LGBTQ support programs and resources that are bilingual or in Spanish and that also understand the cultural context of being Spanish speaking or Latino,” Posadas said. Gutierrez started volunteering with LGBTQ Connection last year with the goal of making a resource guide for clients. When she started calling around, though, trying to find things like therapists who were LGBTQ-friendly as well as Spanish-speaking, she said she could hardly find any. That’s one of the reasons she has stayed on volunteering, now taking on the new role of “promotore,” because there is such a great need. LGBTQ Connection’s volunteer “promotores” speak Spanish and already have ties to the community. They will learn about the program, then disseminate information to the community, ask for donations, volunteer at our events and help with recruitment. “With the help of our promotores, we are creating more opportunities to bring Spanish-speaking and Latino families, parents and caregivers together to discuss ways to grow understanding, trust and love for LGBTQ youth,” Posadas said. When LGBTQ Connection has events that are geared to the Latino community or that are held in Spanish, Mondragon said that the crowd always seems small. 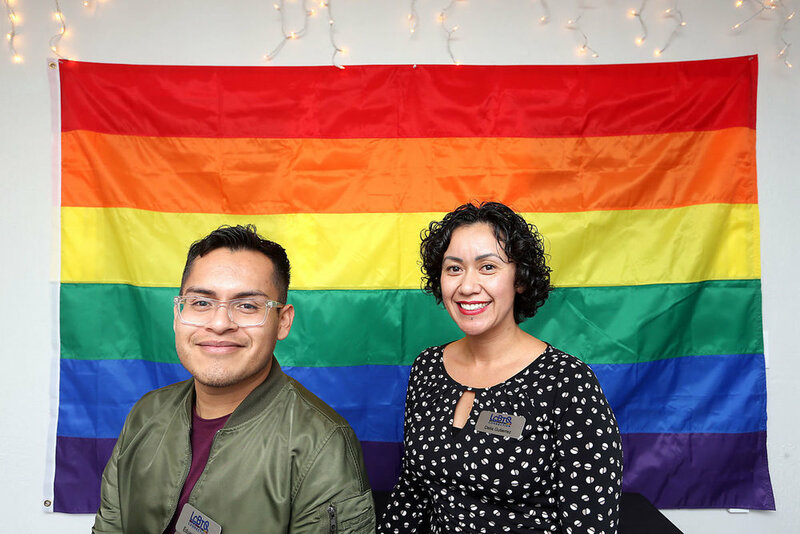 “I think one of the challenges that we’ve seen is getting parents to come to our events, but gradually we’ve been getting more,” said Eduardo Rivera, 23, program coordinator at LGBTQ Connection. Mondragon, 29, who has lived in Napa for much of her life, said that she thinks it makes sense to have someone from the Latino community to promote the organization to that community. Latinos might be more comfortable coming up to someone who looks like them and who speaks their language, she said. LGBTQ Connection, which started as a youth support group in 2010, is at the heart of Napa County’s LGBTQ community and has been working to foster a “healthy, diverse and inclusive” community in both Napa and Sonoma counties.